Speak Percussion has become a favourite of the Australian and international percussion scenes with razor-sharp presentation of large-scale new works. If percussionists usually have complicated relationships with their instruments, which are large and numerous, Speak is no exception. In 2011 the ensemble brought a shipping container of over 400 instruments to Tasmania for MONA FOMA and often ships bespoke instrumental setups around the world. But in a world where music can be made with the scraping of pebbles and found electronics, Speak is moving beyond the world of multiple vibraphones and tam-tams into one of post-instrument experimentation. I spoke with Eugene Ughetti and Matthias Schack-Arnott about their ventures into the music of shells, bells, and fluorescent lights. I catch up with Schack-Arnott and Ughetti while they’re preparing for Anicca, a percussion duo to be performed early November at Melbourne’s Arts House. Schack-Arnott is showing me an enormous wheel, a couple of metres across, which lies in the middle of the room. Covered in concentric circles of bamboo, shells and stones, it might be called a musical mandala. Schack-Arnott: This is the wheel that Eugene and I will play in Anicca. I came up with the idea while visiting temples in India and reflecting on how cycles are represented in Hindu and Buddhist culture. Schack-Arnott: The wheel has two sound worlds. Resonant metals, including tuned aluminium rods or “power chimes,” have an almost Doppler-effect as they spin on the wheel. The second group of instruments are friction-based objects. On the one hand there are natural materials, but there are also man-made elements like sandpaper that allow us to work with textural, polyrhythmic worlds. It sounds almost electronic, almost like an acoustic musique concrète. I use speed as an expressive musical tool that blurs rhythm into texture. In an acoustic setting you are not used to hearing sounds being sped up and blurring into tones. Schack-Arnott: The power chimes are tuned to the overtones of a group of Chinese cymbals which I let drag along the textured surface of the wheel to create white noise, or along the wood to ‘bow’ the cymbals for a singing tone. The vocabulary is completely acoustic, but sounds electronic or post-electronic. Schack-Arnott is also exploring the music of the natural world in Fault Traces, which is to be performed at the Unconformity Festival in Queenstown, Tasmania,15–16 October. His inspiration is however very different this time. The work is a commission from the festival and reflects upon the complex relationship of the town with its natural environment. Queenstown has a history of copper mining stretching back 120 years and, though reliant on it, Schack-Arnott says you can plainly see the destructive effects. Schack-Arnott: It’s a great place to reflect on basic questions around our relationship with the environment. The festival asked me to make a new work and initially I was going to be playing 750 metres underground in a copper mine, but for logistical reasons that is not happening, so now I’m playing in a Boy Scout hall. It’s a piece about tremor patterns, exploring movement beneath the surface, which for me is an exploration of the subterranean in a larger sense. The instrument I play is a 2.4m by 1.4m panel activated by tactile transducers which are fed low-frequency information. These create vibrational patterns that get the surface moving in different ways. On this surface I have percussive objects like cymbals, glass and bamboo that quiver sympathetically with the low-end frequency patterns. I play the instruments in a percussive way, but also trigger these patterns with a foot pedal. It’s a dynamic live performance situation. Because of the scale and nature of the program it has a topographical feel that I think speaks to that place. Schack-Arnott’s focus on natural materials must be a nice change from the ensemble’s recent work with light sources. 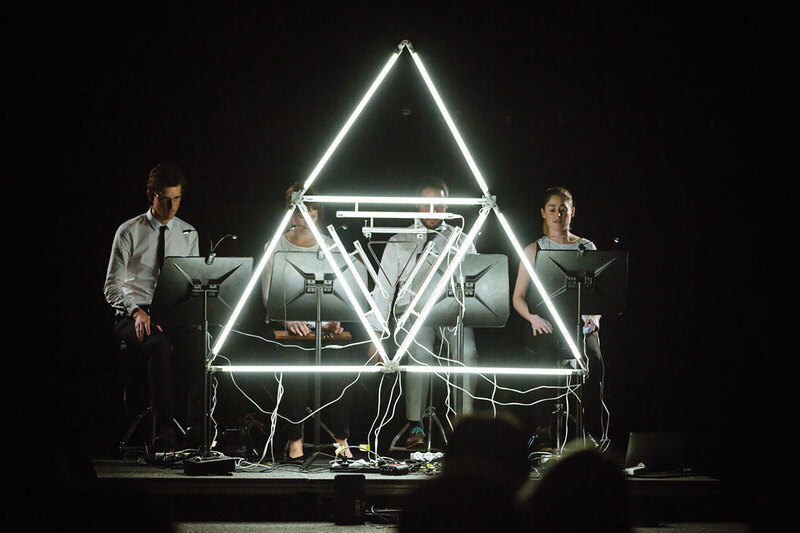 Fluorophone, makes music from lights, lasers and even matches and has been performed numerous times overseas (see Gail Priest’s review of the SONICA performance in Glasgow), but will receive its first Australian performance at Melbourne’s The Substation, 23–25 November. I asked Schack-Arnott and Eugene Ughetti how the technical difficulties inherent in developing new instruments from light sources have shaped the works. Ughetti: In this project the technology is very complex and a lot of it has been developed from scratch for the work. Obviously Simon Loeffler’s piece E, which uses interference in electromagnetic fields around fluorescent lights as a sound source, is probably the most extreme example where he has spent I don’t know how many months on a piece of only 12 minutes, as well as testing expensive processes for realising his idea. We have spent more than $10,000 building the instrument and it still requires further modifications. We cancelled the first world premiere and it’s still being revised. Each of the composers for it have had a really high artistic goal in mind and haven’t just accepted a mediocre result from their initial idea. Other works have been more straightforward, including my own Pyrite Gland which uses tom-tom drums as lighting fixtures housing two rings of RGB-controllable LEDs. As well as being the Artistic Director of Speak, Ughetti is also a composer and is working on a new piece, Bell Curve, to be performed with the Federation Handbells at Arts House on 3 December. Ughetti: Bell Curve is based around the bronze Federation Bells at Birrarung Marr in Melbourne. The idea of the piece is that with the simplest of musical skills some of the most complex musical ideas can unfold in a group. We custom-built a set of wireless click-track headphones for 12 musicians who play patterns in slightly different tempi. The piece is based on “pendulum waves,” which you can watch on YouTube. Imagine a group of pendulums each swinging with a slightly different period. When they are all set in motion at the same time, every rhythmic permutation of the twelve bells will occur. Viewed from the side, these pendulum wave machines make beautiful patterns. Your ears play all sorts of tricks on you, all sorts of polyrhythms and patterns emerging from the bell players. It is a beautiful piece because every part is in constant flux, but because of the way our brain perceives time and space we will find regularities and patterns in what we are seeing. So you see a three-dimensional pattern, then couplets and groupings and subdivisions. But that is just one section of the work. There are all sorts of other beautiful patterns with random and computer-generated tempo changes. All of the complexity is in the programming. It’s very easy to follow the click track. I wanted to create a very beautiful piece of art music that would be satisfying for students to play, but at the same time democratic, so you wouldn’t need your Associate certificate from the AMEB (Australian Music Examination Board) to have the technical skill to play it. Even non-musicians could play it. By using the Federation Handbells, which are a resource free for all Victorians, any school, even those with very small music departments, could access the instruments. We would then provide the synchronised click-track headphones. They can also study the work as a package. Watch Speak Percussion performing excepts from the works discussed in this interview. Speak Percussion won the 2016 Art Music Award for Excellence in Experimental Music (see all the award winners here). The ensemble’s busy program for October-December takes them to festivals in Queenstown, Tasmania and Salihara, Indonesia and back to their home-base Melbourne for a substantial series of appearances.